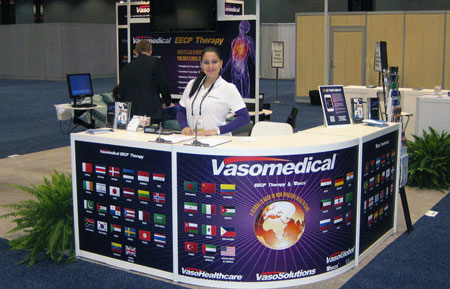 April 3, 2012 - WESTBURY, NY - VasoMedical, Inc. (“VasoMedical”) (OTC: VASO.PK), a diversified medical technology company specializing in the manufacture and sale of medical devices and in the domestic sale of diagnostic imaging products, today announced that its participation at the 61st Annual Scientific Sessions of the American College of Cardiology (“ACC”), which concluded last week in Chicago, IL., drew high levels of interest. 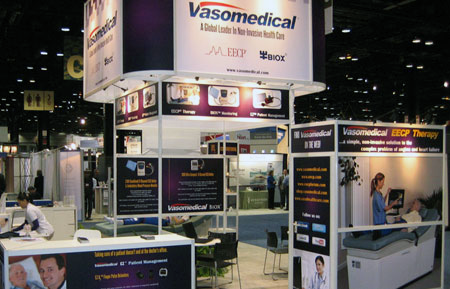 For the past 17 years in a row, VasoMedical has exhibited and conducted live demonstrations of its proprietary Enhanced External Counterpulsation (EECP®) therapy at the annual Scientific Sessions of the ACC. 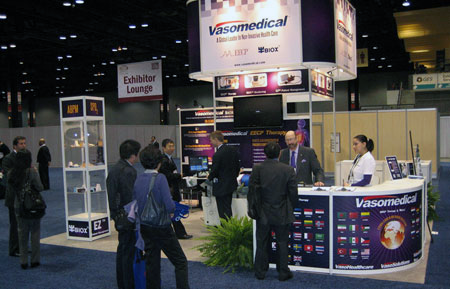 The well received display this year significantly enhanced the presence of VasoMedical in the cardiology world with its exhibit, an attractive, large island booth with its tower emblazoned with the VasoMedical logo and brands visible throughout much of the exhibition hall. Visitors were also impressed by the graphic display proudly showing the flags of 69 countries in which VasoMedical has entered the market and is actively promoting both its EECP® systems, its state-of-the-art BIOXTM ECG Holter and Ambulatory Blood Pressure monitoring systems and its patient management products. “The interest shown in our product line by physicians attending the conference, as well as in VasoMedical's new corporate image as a group of medtech companies focusing on delivering quality healthcare products, was extremely rewarding,” said Dr. Jun Ma, President and CEO. “As our effort in promoting clinical benefits of EECP® therapy to practicing physicians is continued, we are also actively demonstrating to the healthcare community the cost effectiveness of EECP® therapy by reducing emergency room visits and hospitalization of cardiac patients. This is a very important message, especially in these uncertain times in healthcare,” he continued. December 5-8, 2012: and the Russian Pharma and Medical Device meeting in Moscow, Russia. Look for announcements regarding these events on the VasoMedical website, and follow the Company on social networks such as Facebook, Twitter, and LinkedIn.